Check back frequently as new products for sale are always being added! I love specials orders; e-mail me with yours today. Products on this webpage are eligible for discounts featured in the "Sales and Promotions" section of this site unless otherwise noted. 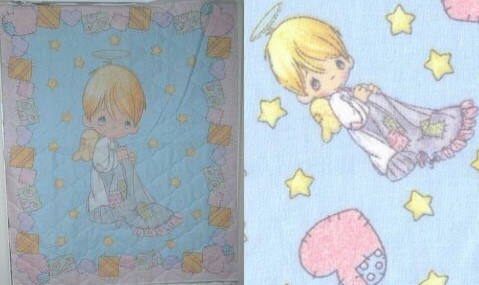 This crib-sized quilt features a Precious Moments angel on one side, and matching angel fabric on the reverse. The quilting is complete and I will add whichever color border you choose. This quilt is suitable for either a baby boy or a baby girl and makes a great gift. Discounts have already been applied to this product. The only discount this item is eligible for is the 10% first time buyer discount. My NEW "Quilted Accessory Holders" are perfect for bathrooms, bedrooms, dorm rooms, and lockers. Add clear plastic photo pockets to any pillow, wall hanging, or quilt for $3.00 each. The price for additional hand-embroidery (for personalization, etc.) is 50 cents per word with a six-word minimum. All quilts come with a "hanging sleeve" at no extra charge. If you prefer tabs instead, please add $10.00 to the price of your quilt. Because my quilts are hand made, all sizes are "give or take an inch", but are as close to the dimensions above as possible. Quilts larger than Crib Size, Photo Quilts, T-shirt Quilts, and other specialty items are individually priced and vary according to design, etc. Contact me for more details and a free estimate. If there's something that you'd like and you don't see it listed here -- ask! i can make almost anything. Prices vary according to quilt size, complexity of design, etc.